Once the payment is done, there is NO CANCELLATION and NO REFUND. If your arrival date is within less than 7 days, the reservation will be immediately charged. Please be aware of 5.5%city tax are Excluded and will be added to the total amount. Once you are in Amsterdam for a short or a long period, you will need a quiet, clean and friendly place to stay in. Of course, we’re located near to the main spots of Amsterdam (a central location), but still away from noisy streets. We’re located near to Amsterdam zoo and the green heart of Amsterdam; it’s nice, calm, and easy to reach most of the visitors’ sites by walking or public transportation. You can get to Central Station, Dam Square, Red Light District, Rembrandt Square and Waterloo Square on foot. We’re also surrounded by grocery stores, restaurants(Italian, Asian and Turkish), coffee shops, bars and cafes. We promise that we do our best to make your stay as pleasant as possible. Please note that we only accept guests aged between 18 and 28. We do not accept bookings of more than ten people online. Not a bad place to stay for the money! It was just very small, but maybe that's just Amsterdam. We stayed in a 6-bed mixed dorm and I woke up to another guy's feet in my face. Just a very tight fit. Two people in center of the room was enough. It was fine for just a place to sleep, just not a ton of space to hang out. The location wasn't bad considering the price. We walked everywhere and it wasn't too far (generally 25 mins.). Overall, I would stay again if I was on a budget. Overall, the cheapest place (which doesn't mean it's actually cheap) close to the center including a very good connection to the central station (just a few tram stops away). The beds are small, but fine for one person. What I didn't expect was that there are hostels without a kitchen and with less lockers than people in a dorm. There's a kettle, but that's it. That's why value for money is really low in that case. I would recommend the hostel for any stay shorter than 2 days. Lovely staff, cheap bites available in reception, relatively clean. If looking for a cheap hotel to only sleep in, this is definitely the place! The only problem we had during our stay was caused by other customers. Someone has lit a joint in their room, setting off all the fire alarms and the staff seemed a little confused as to how to switch it off. In result, everybody had to evacuate the building for half an hour at 4 in the morning, as the alarm was piercing our ears. The place needed cleaning especially the floor and a lot of weed smoking around. this is obviously their choice but there was even an incident that someone was smoking inside I reported this and got mocked, Overall I think a nice family who own the property. More cleaning is a request. Although the location is nice (the only good thing about this) our overall experience was a nightmare. Lockers were suposedly included with each bed, and yet we were told they were all taken, which forced us to lock our belongings in our car. All the doors, including the front one, were left open 23/7. The facilities are non existent. After trying to cook a simple meal in the « kitchen », we were told only the microwave was available for guests. Showers did not exist. To avoid at all costs. This is by far the worst hostel I have ever experienced. The rooms and bathrooms were incredibly dirty and smelly and there were no lockers to lock up belongings. There were only weird, staring men staying in the cramped 30 person room and as a female traveller I felt EXTREMELY unsafe - so much so that I left halfway through my trip to stay in a hotel instead. Staff was very unhelpful and didn't seem to care about me or my friend's safety. Worst traveling experience I've ever had. Oh boy, I do not know where to start here. 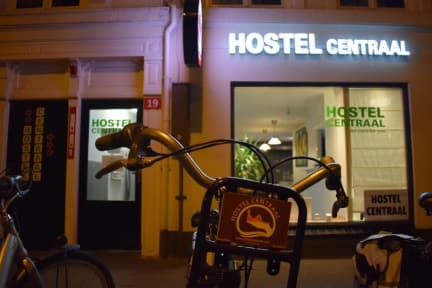 This hostel was so underwhelming that I spent the money to stay in a hotel room because the conditions were unbearable. The stringy-haired man at the front desk was terrible at communicating with our group. There was a pungent odor rooted in the building that made me wish I had a used Indian diaper strapped to my face instead. The rooms were very small and I could have slapped the guy in the face next to me from where I was supposed to sleep. Worst hostel ever. Place smells like dirty laundry 24/7. Linens were not fresh and facilities were disgusting. Pay the money for a hotel and not this s**thole.